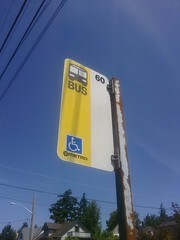 This Route 60 stop at 15th and Hanford is safe, but the stop just to the south at Hinds is proposed for closure. Photo by l0st2 in the Beacon Hill Blog photo pool on Flickr. Metro Transit has announced that they will be reducing the number of stops on Routes 36 and 60 to improve the speed and reliability of the buses on those routes and also reduce costs, energy consumption, and emissions. The planned removals will increase the average spacing between stops to about 1,150 feet from the current 920 feet. The two routes currently have a combined total of 137 stops south of South Jackson Street (including Route 60’s trips through Georgetown and West Seattle); 28 of these would be removed, including 20 stops on Beacon Hill. One new stop would be added, on 14th Avenue South at South Walker Street, where it would replace the current stops at South Hill and South College streets. According to Metro, 11 percent of Route 36 and 60 riders who board south of Jackson will have to catch their buses at a different stop. You can see an interactive map and a list of all the stop closures on Metro’s website. The page also contains a list of options for sending Metro your feedback about these changes. Crocheting by Mandy Greer, for the project "Mater Matrix Mother and Medium", an interactive, process-based art installation. Photo by Jennifer Zwick. 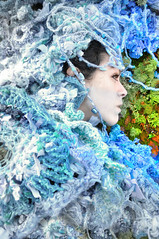 Artist Mandy Greer is creating Mater Matrix Mother and Medium, a “process-based temporary public art installation” that uses recycled fabric and yarn along with the volunteer help of many hands to build the installation. You can help crochet this artwork at the Beacon Hill Library on May 24 — all skill levels welcome! Details are here.